Love: Something to love about myself. Patience: Where can I be more patient with myself? Kindness: Where can I be kinder to myself? Strategies: Strategies to draw on in forging a better relationship with myself. Here’s another spread with two distinct applications in resistance work: self-love and self-care. Paying attention to everything that’s happening nationally and globally can leave us feeling drained and heart-broken. It brings awareness to some of the darkest aspects of humanity, our history, and our own hearts and minds. Many of us find ourselves confronting unpleasant and unwanted patterns and impulses within ourselves, our families, and our communities, such as prejudice, internalized oppression, violence, and rage. It’s absolutely necessary that we confront these things honestly, while working to dismantle and heal them. This may not be easy, nice, or fun. It requires courage and prioritizing truth and healing over comfort. It also requires the balancing practices of love, patience, and kindness. We need to acknowledge and take responsibility for the worst within ourselves. We can’t reduce the harm we do if we’re too afraid to see it. But we can’t dwell here full-time either, or we risk wallowing and despair. We must also visit the best within ourselves and others. There, we can ground ourselves in a sense of all that is good and right about us, so we can grow that goodness and heal. We can direct love and patience inward, so we know what it feels like, so we can expand it outward, and ultimately so we have something to keep fighting for. We can periodically refresh our faith in humanity and in ourselves so that we know—not just hope or suppose—that we can do better. Self-love lays a foundation for that faith. Care is a key component of love, and invaluable in trying times. With stress-levels running high and so much work to tackle, it’s necessary to maintain self-care and steady pacing to avoid burnout, fatigue, and despair. Love: How can I best express love for myself through practical action? Patience: How can I be more patient with myself? What can I tackle more slowly or put on the back-burner to work at a healthy, sustainable pace? Kindness: How can I be kinder to myself? What is something nice I can do for myself or give to myself? Strategies: Strategies to draw on in creating or maintaining a good balance between my care for others and my care for myself. Self-care takes many forms. Marketplace gurus love selling us (especially the femmes among us) self-care through mani-pedis, glitter bath-bombs, and cashmere sweaters, but true care runs deeper than feeding our closets. How do we feed our bodies, minds, and souls? At any given time, we’ve all got a handful of The Big Questions burning holes through our spirits. You can’t patch those kinda holes with spa dates and unicorn frappes. Don’t get me wrong, it’s fine to enjoy nice things, and unicorns are swell. No shame. By all means, frappe away if that’s your thing, just don’t let the spa or the shopping mall become the poppy field that seduces you off your Yellow Brick Road. On a practical, mundane level, self-care can look humble and basic: taking a shower, taking a walk, pausing work to tidy up your space, cooking yourself a good meal, turning off your phone while you eat dinner, and getting enough sleep. Shop therapy can be nice and fun, but sometimes we need permission to take a nap or read a book more than we need new stuff. On a deeper, spiritual level, self-care might look like maintaining a religious or meditative practice, journaling through what ails you, extending yourself forgiveness, or making art—voicing your pain and healing, celebrating your joy, and expressing your truth. It’s not easy for everyone to find the time and resources to prioritize these activities. These might not be daily practices for all of us, especially for those working in high-pressure jobs, working multiple jobs, and/or taking care of family. Let’s acknowledge for a minute what the marketers seldom do—that those who most need care often have the least time or money to spend on it, and those who spend the least on occasional luxuries get shamed the most for indulging. That’s backwards. We don’t always receive the love and care we deserve, but we do all deserve love and care. It’s okay to take time and spend resources on yourself when you can. Loving yourself and giving yourself what you need is not a selfish indulgence, especially when it keeps you going and allows you to give and do more for others. And if you already do have all the time and money in the world for rest, relaxation, and luxuries, caring for your spirit might include doing more loving and altruistic things for others. Inner and outer care are not mutually exclusive. They pair very well. This spread combines emotional, intuitive, soothing water, and passionate, creative, inspirited fire. Think of the burning, bleeding heart, riled with compassion and radiating fierce love. Think of a kettle of something warming and wonderful steaming over a hearth or campfire. There’s our sweet spot in balancing these two elements: warming our hearts to our selves with energy and cheer, and extending good feelings within and without. ​Watch out for too much of a good thing with elemental imbalances. A lot of fire beneath a little water steams up fast. While steam can be channeled to heat a home or power an engine, it can also burn as bad as an open flame. Symbolically, that might look like passion, anger, or zeal whipping your emotions into a frenzy, cutting off your intuitive stream to the point that you make bad decisions and cause harm. In the context of self-love, this could represent taking your own side to the exclusion of all other viewpoints, grasping at love for yourself through hate or rejection of others, selfishness, or narcissism. Conversely, apply a little heat to a lot of water, and you get a stagnant pool with all kinds of funky slime beasties brewing in it. This pattern plays out when self-care techniques are abused as pacifiers and masks, used to avoid challenging personal work, and to feel good while dodging responsibilities and meaningful action. • Think Globally: We live in a richly flawed world-in-progress, we are a richly flawed species-in-progess, and there come happenings that test our faith in humanity, and deliver us a bone-deep ambivalence about moving through this world. 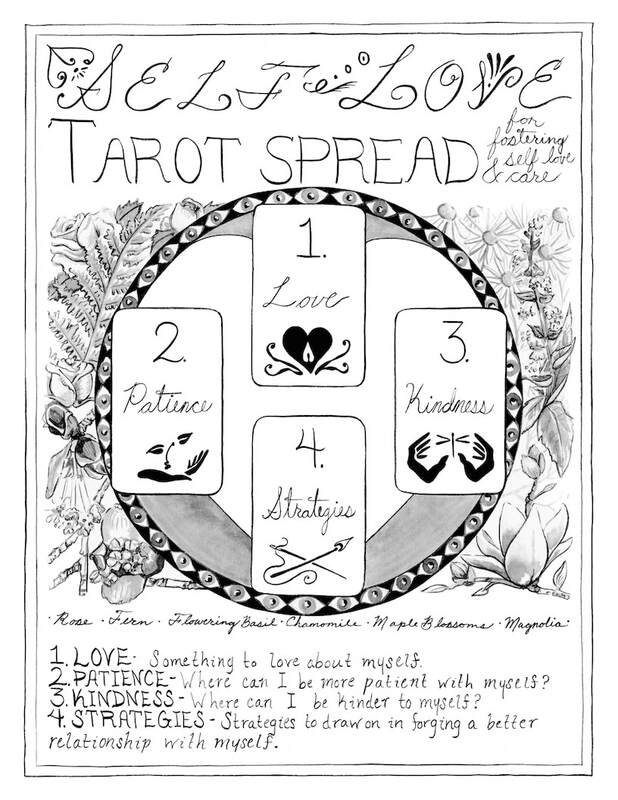 Use this spread to ask for strategies to stay loving towards humanity in the face of dreadful nonsense, to practice patience and civility with those people who operate from a base of dreadful nonsense, and to bolster the best of your own humanity when you can’t with our nonsense species today. Please note: I consider those philosophies that claim everybody has to love everybody else, because light-and-love or whatever, to be nonsense. Ditto for the notion that individuals owe particular other individuals love, patience, respect, forgiveness, time, labor, or anything else, cause we’re all one universal being. The plane where that one-lovey-being-ness thing is true, if it is true, ain’t the plane we’re deciding on through this work. We live here and now, in separate bodies, and we’re here to do here things now. This exercise isn’t about denying your truth, forcing feelings that aren’t there and don’t have to be, or slapping a happy face on heinous circumstances. It sure as Hell isn’t about loving your way into complicity, suspending censure for those perpetuating heinous muckery. It’s about seeking and practicing techniques to become stronger, gentler, more compassionate, and more courageous in the face of whatever shakes your faith in humanity. It’s about finding ways to remember the good and loving parts of humanity when large chunks of it spew stupendous dirt-waddery. It’s also 100% optional, and it’s fine if it’s not your cup of honey-lemon-ginger. Sometimes we need license to be grumpy at our collective selves, and thank God/s/ess/es, the Void, Lady Nature, evolution, or whoever else you thank, for the company of dogs and cats and trees. • Creativity: Projects can be like babies, and sometimes they need coddling, especially when they’re acting stubborn. Are your muses crapping out on you, or are you forgetting to show up, ask nicely, and listen? Ask how to exercise love, patience, and kindness with a given project, as though it’s a living wee thing you’re nurturing into maturity. Ask how to be more loving and caring with yourself when your tortured-artist streak monopolizes your inner monologue, or the ghosts of critics past and future start hounding you down. • Career: Love and tenderness, qualities our society deems feminine, mightn’t pop first into mind when we think of work and career as we know them in this, the cis-hetero-patriarchy. Feminine traits and labor are still criminally undervalued and under-acknowledged in the paid workforce today. In truth, these qualities are immensely valuable in all areas of life, including office and board-room. Brainstorm ways to strengthen professional projects and relationships with a little TLC by turning this spread towards your work. Boost yourself back up when exhausted from fielding dystopian malarkey at work or in school by turning this spread inwards after clocking out. 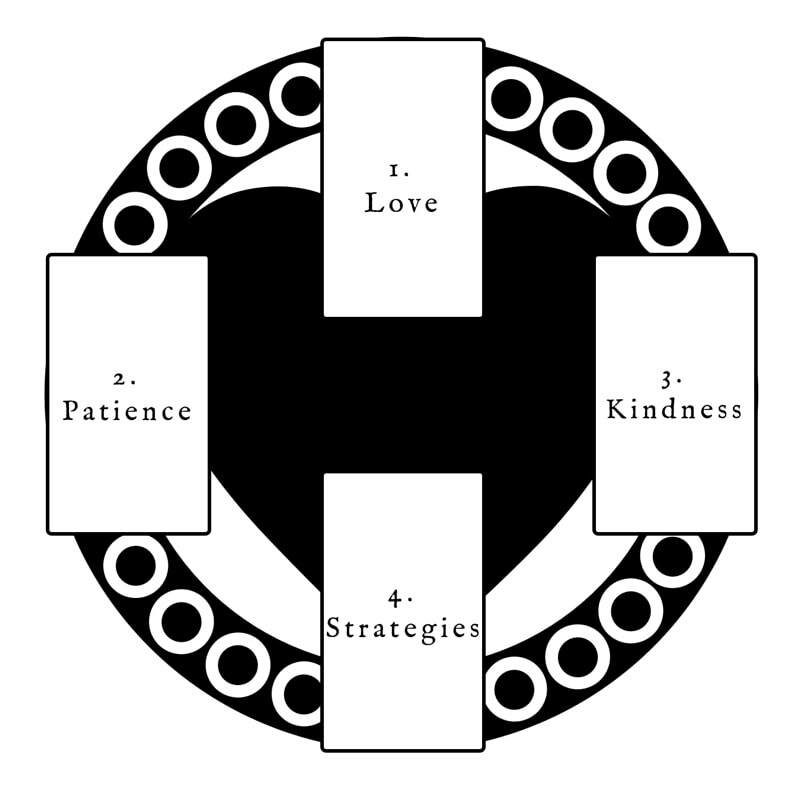 ​• Relationships: This is a fantastic spread for relationships. Ask how you can be more loving, patient, and kind towards a friend, relative, colleague, or partner. Look for strategies to improve the relationship in question. If reading with a partner, ask for ways that you can both strengthen and deepen your relationship together through love, patience, kindness, and practical action.